LinkedIn is a very popular professional networking platform, where job seekers and employers can connect. As a job seeker, it can be tough to find a job on your own. Creating a LinkedIn profile gives you many advantages, especially against candidates who do not have an account. If you haven’t had the chance to create a LinkedIn account yet, here are five reasons why you should. LinkedIn is basically an online version of your resume. With LinkedIn, you have the option to send the URL of your LinkedIn page to potential employers, in place of a physical resume. You can search and apply to job opportunities on LinkedIn. Instead of emailing your resume file, you can apply to jobs on LinkedIn with a click of a button. When you apply to any job opportunity on LinkedIn, your LinkedIn information will be sent automatically to the employer hiring for the position. There’s no need to prepare extra documents, or to change your resume. Even if you do not apply to job opportunities, employers can still view your LinkedIn profile. Potential employers can contact you on the platform if they think you are a good fit for an opening at their company. By creating a LinkedIn account, jobs could come to you! LinkedIn puts you on the map. If your profile is set to public, any potential employer can view your information. So if you’re open to relocating, or doing some freelance work across the world, LinkedIn is something that you should explore. Having a LinkedIn profile shows that you are forward-thinking, up-to-date with the latest technology, and open to new opportunities. You are setting yourself apart from candidates who do not have an account. 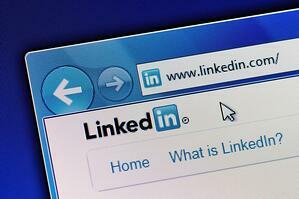 Still unsure of whether you should create a LinkedIn account? Contact Liberty Staffing today for more information. We believe that LinkedIn is a great networking platform for job seekers. Don’t forget to follow us on LinkedIn! We post job opportunities, and helpful career tips.